Some of the references are more wry, taking advantage of Leopold’s skill in subtly expressing consequential thoughts. “There are two spiritual dangers in not owning a farm. One is the danger of supposing that breakfast comes from the grocery, and the other that heat comes from the furnace.” From such seeds whole discourses — whole movements — can grow. And have. It is hard to imagine Leopold’s continuing ripple effect in the world apart from the role that his published works has played in advancing it. Seventy years ago this year, Leopold completed and submitted the manuscript for A Sand County Almanac (1949), his highly influential collection of essays. It is estimated that more than three million copies have been sold over the decades, and it has now been translated into a dozen languages. Over the last twenty-five years, as interest in Leopold’s work has continued to grow, several collections of his other articles and essays and previously unpublished works have appeared. And through a partnership of the Aldo Leopold Foundation and the University of Wisconsin-Madison, the rich archival collection of Leopold’s papers have been digitized and made available to scholars. 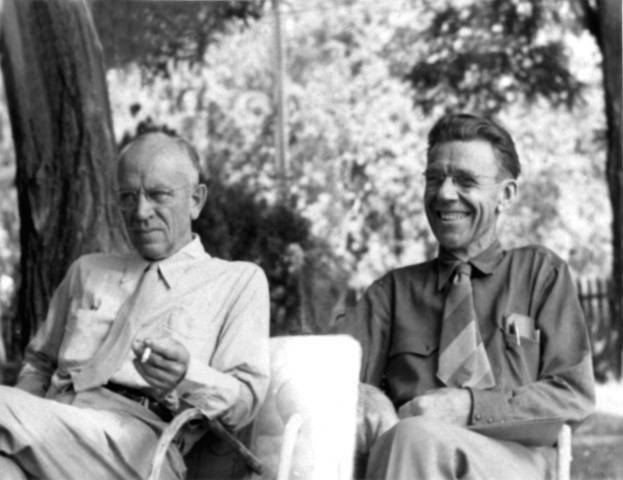 Aldo Leopold (right) with Olaus Muire at the annual meeting of The Wilderness Society Council in Old Rag, Virginia, 1946. United States Fish and Wildlife Service. Public Domain via Wikimedia Commons. Five years ago I was invited by Oxford Bibliographies to prepare the entry on Leopold for its “Ecology” section—a far more daunting task than I anticipated! Leopold’s own body of writings was large and diverse. Scholarship on Leopold, his many areas of influence, and especially his concept of a land ethic has expanded tremendously in volume and scope, over many decades. After realizing that I could hardly embrace the whole ocean, I made my best effort to distill it. Scholarly interest in Leopold has hardly slowed since then. And so Oxford Bibliographies came knocking at my e-mail box again last summer, inviting me to update the entry. Over the last several weeks I have been at work on that job, surveying and summarizing the last five years of published works on Leopold. Collectively, they reveal much about the state, not only of Leopold scholarship, but of current thinking in conservation, ecology, and environmental studies. We find scholars from a dozen different fields carefully examining, exploring, criticizing, and extending Leopold’s thinking—on such diverse topics as water and marine ethics, global climate change and sustainability, human health, urban studies, ecological economics, and the cultural context of Leopold’s early conservation advocacy. Most recently, Estella B. Leopold published a personal account of life in the Leopold family. The youngest of the five Leopold siblings and a distinguished paleoecologist, Estella at the age of 90 remains active as an emeritus faculty member at the University of Washington and as a board member of the Aldo Leopold Foundation in Wisconsin. It seems that Aldo Leopold, at 130 years old and counting, still inspires a sense of wonder, still suggests creative responses to our sobering social and environmental challenges, and still demands that we think critically about the “delights and dilemmas” that our relationship to the living world entails. Featured Image credit: The shack near Wisconsin Dells, Wisconsin, where Aldo Leopold spent time and was inspired to write A Sand County Almanac. Photo by Jonathunder, GFDL 1.2 via Wikimedia Commons. Curt Meine serves as senior fellow with the Aldo Leopold Foundation and the Center for Humans and Nature, and is Adjunct Associate Professor of Forest and Wildlife Ecology at the University of Wisconsin-Madison. He is the author of Aldo Leopold for Oxford Bibliographies in Ecology. Thanks Curt for this thoughtful piece. 30 years and yet his thoughts are far ahead of the politicians of today. Wouldn’t he have made a great senator for Wisconsin!